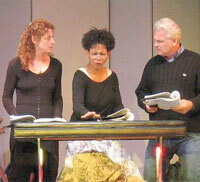 The Blue Horse Repertory Company presented a reading of "The Little Oasis" by Lora Lee Ecobelli. This mystery drama, based on a true event, spans two centuries of lost legacies, ghosts and racism in the Blue Ridge Mountains of Virginia. Cast: Lora Lee Ecobelli, Donna James, Kurt Zischke, Peggity Price, James Smith and Kim Sykes, all of whom are appearing through special arrangement with Actorsâ€™ Equity Association, the union of professional actors and stage managers. Joe Capone - Director.